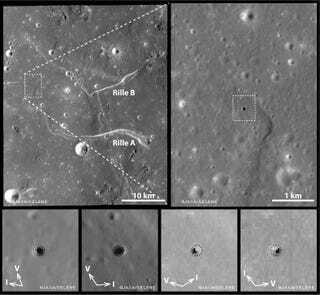 "We discovered a vertical hole on the moon," says JAXA's Junichi Haruyama. A mysterious tube so large and deep that it can shelter a future moon base. Until the creatures inside kill everyone, which is what happens in these cases. Lava tubes, underground cave-like channels through which lava once flowed, are commonly found on Earth. Because lava tubes are sheltered from the harsh environment on the moon's surface, such tubes could one day be useful for lunar bases. Their theory is that the flowing lava left the tunnel a long time ago, with a lava roof that later collapsed. I'm reading their report and only two things come to my mind. One, the awesome lunar base in Stanley Kubrick's 2001. Two, a sci-fi horror movie flick directed by Roger Corman, in which the moon base is invaded by slimy aliens, pissed off because the humans built their base on top of the entrance of their hidden colony. Based on real events, of course. OK, maybe I have three things in mind, because now I can see Sybil Danning there too, as the queen in "Amazon Women on the Moon." No hole connection there, though. Or maybe there is. I don't know. Whatever. Leave me alone. I'm drunk.